Avi and I had a fun outing on Tuesday. 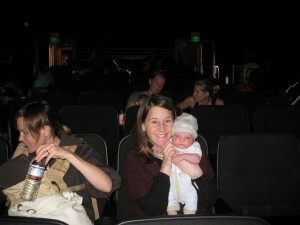 We went to the Vogue Theatre where Avi had his first movie theater experience! We did it up right witnessing Kate Winslet’s Academy Award winning performance in The Reader. Why did we rush out of bed and drive all the way across town on a Tuesday morning for this showing? To my surprise and delight the Vogue Theatre has a special Mommy’s Matinee on the first and third Tuesday of every month, and we had to check out the scene. Additionally, I promised to meet four other women and their babies from my Mammas’ Group, and as any other mother knows — social time is imperative. Mommy’s Matinee is so called because, well, there were mommies, nannies, and babies EVERYWHERE. Other perks include brighter lights so mum can properly watch over and care for her little one, and they also turn the sound down a bit so babes don’t get spooked by thundering noises coming from the movie. This showing is definitely not for the average movie-goer. You must be a mom with baby in tow to appreciate aisles lined with strollers, and car-seats, nursing ladies, and crying babies in every direction. I can’t wait to go back! If you look closely you can see other moms and babies in the background.